You are Here : Home > Visit a Farm > Maryland "Visit a Farm"
We have fresh air and lots of room to run and play, and all kinds of new things to see. 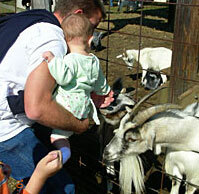 Our barnyard animals love to have visitors all year round, even when the farm market is closed. We have bunnies, goats, horses, a miniature Goat Walk at Milburn Orchards, Elkton, Maryland donkey, chickens, pigs, ducks, turkeys and more. Bowles Farms is Southern Maryland's largest cornfield maze and pumpkin farm. Each year we've been open, our maze has been cut into a design depicting some of Maryland's history, events or icons. Magical time on the farm, when everything from apples to pumpkins are ready for harvest. Your family will love a day on the farm: Family fun and pumpkin patch at Weber's Cider Mill Farm in Parkville, MD, NE Baltimore. * Visit the Pumpkin Palace * Hayrides for the whole family * Straw Maze & Mini Maze for the younger ones * The Boo Barn & Giant Hillside Slide * Pedal Tractors & Duck Races * Gem Mining & Farm Animals * Locally grown, farm fresh Fruits and Vegetables * Delicious fresh baked Breads, Pies & more!